Marxist theorist of indigenous Latin American liberation. US: NATIONAL FLAG DESECRATION DAY. The mark of the beast. POP GOES THE WEASEL DAY. 1381 -- England: Wat Tyler's peasant rebels capture London Bridge & the Tower of London. They kill the English Chancellor & Treasurer. 1777 -- US: The Stars & Stripes is adopted as the US flag. The first flag is made of hemp (i.e., marijuana). It replaces the Grand Union flag. 1794 -- John Gibson Lockhart, lawyer, novelist & critic, lives, Cambusnethan in Lanarkshire. He marries Sir Walter Scott's daughter, & writes his father-in-law's biography. 1801 -- England: Benedict Arnold, Revolutionary War benedict, dies in London. Inspires egg dish. 1811 -- US: Birth of Harriet Beecher Stowe, author of Uncle Tom's Cabin . Printed in 1851, a landmark book depicting slavery. She journeyed to Europe & became friends with George Eliot, Elisabeth Barrett Browning & Lady Byron. British public opinion turned against her when her charges against Lord Byron's love affairs became public. "I am a little bit of a woman, somewhat more than 40, about as thin & dry as a pinch of snuff never very much to look at in my best of days, & looking like a used-up article now." Harriet Beecher Stowe cited in Kenneth Rexroth's Classics Revisited or More Classics Revisited . 1816 -- England: Society for Promotion of Permanent & Universal Peace founded, London. The Peace Society, founded by William Allenis, is the first British pacifist association. 1826 -- Turkey: Insurrection of the Janissaries, Constantinople (Auspicious Incident). 1827 -- US: Philadelphia journeymen house carpenters demand a 10-hour working day (they finally get it in 1860). 1834 -- US: Sandpaper patented by Isaac Fischer Jr., Springfield, Vermont. 1838 -- US: Steamship Pulaski blows up off the North Carolina coast, killing 140. 1846 -- US? : Bear Flag Revolt: California Republic declared by settlers. 1848 -- Cuba: Antonio Maceo lives (1848-1896). Known as the "Titan of Bronze," Maceo is one of the outstanding guerrilla leaders in 19th-century Latin America. Daily Bleed Patron Saint December 7, 2007. Exemplary first Cuban revolutionist, independentista. 1855 -- US: Robert M. "Fighting Bob" LaFollette lives. Pursued public policies to improve the lot of farmers, workers, children, & women. 1865 -- France: Bernard Lazare lives. Author, journalist, anarchiste, defender of Dreyfus. Collaborated on the journals Les entretiens politiques et littéraires & Temps nouveaux . 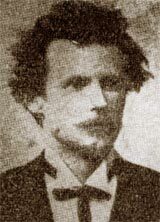 1872 -- Libertarian Jules-César Rozental lives (or 1878? ), Irkutsk, Siberia. Militant anarchist fighter. Author of Chants inachevés (poèmes), ("Unfinished Song", posthumously published in Bulgarian in 1904). Son of a Polish-born Russian revolutionary who fled to Bulgaria, accompanied his father (a doctor) in the Bulgarian villages— using the opportunity to sow the seeds of anarchy. Joined the Macedonian revolutionary movement, with the partisans of anarchist Nicolas Detchev in the effort to expel the occupying Turkish. On the night of 11 to 12 September 1903, a battle near the village of Loukovo left over 400 Turkish soldiers dead, as well as 113 Bulgarians including Detchev. Rozental, seriously wounded, died September 14. 1877 -- US: First Flag Day declared by the federal government (100th anniversary of the flag). 1883 -- Poet/translator Edward FitzGerald ( The Rubaiyat of Omar Khayyam ) dies, Merton, Norfolk. 1884 -- American poet Emily Dickinson suffers a nervous collapse. 1894 -- Perú: José Carlos Mariátegui lives, Maquegua. Wrote La escena contemporánea (The Contemporary Scene). His Seven Interpretive Essays on Peruvian Reality (1928, tr. 1988) is a masterpiece of social analysis. See J. M. Baines, Revolution in Peru (1972). 1896 -- Jean Le Gall lives. French anarchiste. 1900 -- France: French intelligence notes the presence of Hippolyte Havel & Emma Goldman at a women's congress in Paris. French police files reveal that Emma's movements were closely followed when she visited Paris at the turn of the century in part because the French authorities mistakenly suspected that as a prominent anarchist she played a role in Gaetano Bresci's assassination of King Umberto of Italy. 1903 -- France: Anarchiste Fortuné Henry, en costume de ville, des outils sur l’épaule et accompagné de sa chienne Néra, arrive à Aiglemont. De là, celui qu’on appellera dans la région "l’houme libre," gagne les bois du Gesly et s’installe sur une parcelle qu’il vient d’acheter. 1905 -- (Old Style) Mutiny begins on the Russian battleship Potemkin after sailors are shot for complaining about being served maggot-ridden meat. Tomorrow, the Potemkin arrives at Odessa where they take the body of a dead comrade ashore amid an outpouring of popular sympathy. Civilians join mutineers in revolutionary actions that include burning granaries, quays & ships in harbor. Part of the 1905 Russian Revolution in which thousands participate, & the soviet (councilist) form first appears. The mutiny is the basis for a great film by Sergei Eisenstein, with music scored by Dmitri Shostakovich. — see also 17 June. 1908 -- Kathleen Raine, British nature poet, lives. Involved in a tempestuous relationship with Gavin Maxwell. Much of her poetry is inspired by the landscapes of Wester Ross. She was an expert on Coleridge, Blake, & Yeats. 1911 -- US: Los Angeles police arrest the anarchists Ricardo Flores Magón & his brother Enrique for violation of the US neutrality law. 1914 -- Ruthven Todd, poet/novelist lives, Edinburgh, Scotland. Involved with the surrealists at the time of the 1936 International Surrealist Exhibition. 1914 -- US: Emma Goldman lectures (June 14-July 10) in Frisco, California. Her reception is disappointing compared to her experience in Los Angeles. She speaks on "The Intellectual Proletarians," "The Superman in Relation to the Social Revolution," "The Mothers' Strike," & "Anti-Militarism: The Reply to War." 1914 -- Italy: A General Strike is broken by the treason of the Socialists & their trade union, bringing an ignominous end to "The Red Week of Ancône." Errico Malatesta, escaping the police, is forced again to flee into exile, to London. 1914 -- Brazil: First session of the anarchist conference in São Paulo. Five sessions were convened in total, preparing for an anarchist Congress in London, which was canceled due to WWI (the Great War Which Ended All Wars, remember?). 1916 -- Georg Henrik von Wright lives. Finnish philosopher/logician, influential cultural critic/essayist. Associated with Vienna School of logical positivists (Rudolf Carnap, Otto Neurath, Karl Popper, et al). Wrote analytical & applied logic, literary essays (Leo Tolstoy, Fyodor Dostoyevsky), popular books on philosophy & scientific knowledge & defended humanist ideals. An executor of Wittgenstein's literary estate. 1917 -- US: Emma Goldman ignores rumors of a death threat, speaks at an anti-conscription meeting chaired by her pal Alexander Berkman, who also speaks. Police raid & arrest all men of draft age who cannot show proof of registration. 1919 -- Russia: Beloved & Respected Comrade Leader Trotsky, chief of the Red Army (aka The "Red Butcher" of Kronstadt), drafts an order banning the Makhnovist (anarchist) Congress, accusing them of opposing Soviet power in the Ukraine. Trotsky calls for the arrest of the delegates. 1919 -- Canada: First nonstop flight across the Atlantic (Alcock & Brown) leaves Newfoundland. 1921 -- US: In West Virginia, still under martial law, Davis & Brockus lead state police & vigilantes in a raid on the Lick Creek tent colony, in retaliation for further sniping incidents. 47 strikers arrested & locked in the Williamson jail. 1924 -- US: San Pedro, Calif. IWW labor hall raided, children scalded, hall demolished. 1924 -- Italy: Presentano le dimissioni il sottosegretario agli Interni Aldo Finzi e il capo dell'ufficio stampa della presidenza del consiglio Cesare Rossi, in relazione al caso Matteotti. 1926 -- American impressionist painter Mary Casset dies. 1928 -- Argentina: Ernesto "Che" Guevara, Cuban guerrilla, lives (1928-1967). Argentine doctor, who rejected both capitalism & orthodox communism. Hero of the Cuban revolution, iconic hero of 60's culture. 1933 -- Novelist Jerzy Kosinski lives, Lodz, Poland. 1935 -- Chaco War between Bolivia & Paraguay ends. 1938 -- Dorothy Lathrop wins the 1st Caldecott Medal (for kid's book authors). 1940 -- Poland: A German Nazi extermination camp opens at Auschwitz — 3,000,000 die here. 1940 -- France: Marching on a road of bones, German forces occupy Paris. 1941 -- African American novelist & social critic John Edgar Wideman lives. 1941 -- Russia: Beloved & Respected Comrade Leader Uncle Stalin begins mass deportation of Balts to polar & desert regions. 1942 -- US: First bazooka rocket gun produced, Bridgeport, Connecticut. 1942 -- Anne Frank makes the first entry in her diary. 1943 -- US: Supreme Court overturns a West Virginia mandatory school flag-salute law. A victory for Jehovah's Witnesses, who refuse to salute any flag. (West Virginia State Board Of Education V. Barnette, 319 U.S. 624; Argued March 11). This reverses a decision made in 1940, on the same issue, in which the court ruled it was legal to force Jehovah's Witnesses to salute the flag (Minersville School District v. Gobitis). 1944 -- Canada: Co-operative Commonwealth Federation wins majority in Saskatchewan elections, forming first socialist government in North America. 1946 -- A Flicker of Hope? : The valves & tubes of John Logie Baird, inventor of television, finally burn out. Sheriff's deputies searched today for three gunmen who shot an elderly farmer when he refused to tell them where he had hid an ancient & rare German Lutheran Bible. After wounding 63-year-old J. Frank Miller in his home seven miles north of here yesterday, the bandits ransacked his house; they found the Bible in a bureau drawer but passed up nearly $100 in currency. The Bible was one of two in existence & was "between 400 & 500 years old." "I once read in a newspaper," he said, "that a similar Bible, not quite as old, had sold for $87,000 & is in a museum in England." 1951 -- US: Red Army? Beloved & Respected Senator "Tail Gun" Joe McCarthy attacks General George Marshall, author of the Marshall Plan, for "always & invariably serving the world policy of the Kremlin." Equally to blame, according to McCarthy, "in a conspiracy so immense as to dwarf any such previous venture in the history of man," was Marshall's "fast-rising protege," General Dwight David Eisenhower (future president). 1951 -- US: Unveiling of UNIVAC I, first commercial computer. First UNIVAC computer installed in Census Bureau. 1954 -- US: Indefensible? : Beloved & Respected Comrade Leader President Eisenhower signs order adding words "under God" to the Pledge of Allegiance. Sticks it between "one nation" & "indivisible." (See "Witch Hunt" Joe entry above ). 1955 -- US: Judge & Jury? Killers hired by Judge Joseph Peel, who was being investigated for corruption, drag Judge Charles Chillingworth & wife from their home, wrap them in chains, & drown them at sea, Manalapan, Florida. 1959 -- ¶ Pull My Daisy , a film by Alfred Leslie & Robert Frank starring Allen Ginsberg, Peter Orlovsky & Gregory Corso, with music by David Amram & narration by Jack Kerouac is completed. Filming, based on part of a play Kerouac wrote, began in January & screens in November at the Frisco Film Festival. 1964 -- Russia: Women Against the Bomb delegation calls for complete nuclear disarmament during visit to Moscow. 1964 -- US: Merry Pranksters Tour America in School Bus (14 June 1964 - August 1964). During the Spring of 1964, the Merry Pranksters think up the idea of purchasing & outfitting a 1939 IHC school bus (christened "Furthur") & driving across the country to New York. There they attend a publication party for Kesey's new novel, Sometimes a Great Notion , check out the World's Fair, & pay a visit to Timothy Leary & his associates at the Millbrook estate of William Hitchcock. They arrive in New York City in mid-July 1964 & are introduced to Jack Kerouac at a fateful party. 1965 -- Jewish mystic, philosopher Martin Buber dies. 1966 -- Netherlands: 2nd day of three day confrontation between Amsterdam police & demonstrating construction workers with Provo supporters, Dam Square. 1968 -- US: Diaper Rash? : Child-care expert Dr. Benjamin Spock & three (or four?) others convicted of conspiring to counsel draft evasion. Target of political attacks & outright repression by the Nixon administration. Refused to support George McGovern (backed by most liberal antiwar activists) in '72, & ran as the candidate of the People's Party. Spock was indicted with the Reverend William Sloane Coffin for publishing "A Call to Resist Illegitimate Authority." The pamphlet declares the Vietnam War "unconstitutional & illegal," & promises to raise funds for draft resistance. The indictment also cited a demonstration eight months ago at the Justice Department, when 185 registration certificates & 172 classification notices were dumped in front of distressed officials. During sentencing, Judge Francis Ford declares the crimes are (quote) "in the nature of treason." But an appeals court overturns the convictions. "No 'healing', no apologies, no memorials, nothing can possibly compensate for the damage done & the pain inflicted....The only thing we can possibly do, twenty years too late, is to try & tell the truth." 1968 -- Rirette Maitrejean dies. French individualist anarchiste. Companion to Mauricius (Maurice Vandamme), & Victor Serge (Kibaltchiche), arrested with Serge & tried Feb 3-27, 1913 for her involvement with the Bonnot Gang (acquitted). A writer for many anarchist publications, such as La Revue Anarchiste, La défense de l'homme & La liberté (founded by Louis Lecoin) in 1959, but gradually went blind toward the end of her life. 1968 -- Paris '68: At the théâtre de l'Odéon, police évacue les derniers "enragés" qui s'y trouvaient encore. Run comrade, the old world is behind you. 1971 -- US: 50 activists, including poet/musician & future American Indian Movement (AIM) leader John Trudell, occupy deserted missile site near Richmond, California. 1972 -- US: EPA bans DDT. YP, UBTCHA. 1974 -- US: A naked man dangles from a small plane that circles the restaurant level of Seattle's Space Needle — a flying streaker. 1976 -- Trial of the Black Panther begins in Mars-Jones story "Bathpool Park." 1979 -- Rolling Stone reports that after 10 years, Little Feat have broken up. In two weeks, Little Feat leader/guitarist/singer Lowell George dies of a heart attack. 1982 -- US: 1,653 arrested at US, USSR, French & Chinese Missions to United Nations, New York City, in "Blockade the Bombmakers" nuclear disarmament sit-ins. 1982 -- Argentina: Sheepishly, de government surrenders to Britain on Falkland Islands, ending a 74-day war over an island populated by sheep. 1982 -- Turkey: Thousands of ethnic Turks arrive in Turkey from Bulgaria telling of repression by the Bulgarian government. 1983 -- Italy: Viene arrestato Alberto Teardo, ex presidente della Regione Liguria. L'accusa è quella di associazione di tipo mafioso, corruzione e concussione. I socialisti si pongono in prima fila tra i corrotti di stato. 1987 -- High Seas: USS Stark's officers found negligent for 37 sailors killed when the ship — in the Persian Gulf to protect Iraq's ally Kuwait's oil tankers from Iranian attack — is hit by an Iraqi Exocet missile. 1988 -- US: American-Soviet peace walk to San Francisco leaves Washington, DC. 1990 -- Romania: Five die in 2 days as pro- & anti-government demonstrators clash, Bucharest. 1991 -- US: A gunman takes hostages & demands liquor, marijuana & 666 jelly donuts, Tallahassee, Florida. 1992 -- US: Greenpeace protesters occupy a US nuclear-weapons test site, Nevada. 1994 -- The UN says it has eliminated Iraq's chemical-weapons stockpiles. Yep-a-doodle. Sounds like a good excuse to go to war & recolonize. 1996 -- US: The FBI discloses that the White House has obtained bureau background reports on at least 408 people without justification. 1997 -- A copy of the first "Batman" comic book (1939) is auctioned for $68,500. "It's a political statement — or, rather, an anti-political statement. The symbol for anarchy!" 1998 -- US: In NYC Antoine Reid, a squeegee man, is shot by off-duty officer Michael Meyer after soaping Meyer's car window. Reid later filed a $100 million suit against the city & the police dept. 2000 -- England: McVictory? : Local residents in Hinchley Wood, Surrey, move caravans onto the parking lot of their well-loved local pub ['The Hinchley Wood'] which was leased by McDonald's — to occupy the site & stop it from being turned into a new store. On June 14, 2000, after exactly 18 months of controversy & determined opposition, McDonald's throws in the dirty towel & hands back the lease on the pub to the original owners. June 16th, after an incredible 552-day, 24-hour-a-day continuous occupation (possibly the longest protest occupation of its kind) local villagers, organised as Residents Against McDonald's (RAM), move their caravans off the site & celebrate an historic victory. 2000 -- Amnesty International reports summary executions in 38 countries, political prisoners in 61 & torture in 132. Our governments hard at work. 2001 -- Algeria: Hundreds of thousands join a protest organized by Berbers. 2002 -- Pakistan: Suicide bomber kills 11 at the US consulate in Karachi. 2002 -- France: Jacky Toublet (1940-2002) dies. French anarcho-syndicalist, militant, son of Julien Toublet, director of the weekly Le Monde Libertaire . 2006 -- México: State police attack teacher's strike demonstrators (some 50,000) occupying streets & the central square of downtown Oaxaca. They also destroy Radio Plantón, but students & teachers take over Radio Universidad, at the Independent University Benito Juárez. 2006 -- Spain: Vicente Marti (1926-2006) dies. Militant anarchist, born to a family of anarcho-syndicalists. Member Federación Ibérica de Juventudes Libertarias (FIJL) & in the 1960s Marti was responsible for getting weapons from France into Spain to aid guerrilla actions against the fascist government. The French government, great promoter of democracy (like most of the West), cracked down on the antifascists. "Je me rappelle bien quand ils ont brûlé l'argent, à Alcira. C'était tout au début de la révolution: les anarchistes, et peut-être bien les socialistes de l'UGT aussi, ont éventré la banque, pris tous les registres, tous les documents. Ils les jetaient par les fenêtres et en faisaient un feu sur la place, en dessous. Et voilà que l'argent aussi, les billets de banque ont volé par les fenêtres, se sont enflammés!" http://www.ephemanar.net/juin14.html#marti French text: Il naît en 1926 à Madrid dans une famille d'actifs militants anarcho-syndicaliste. En 1932, la famille s'installe à Alcira en Pays Valencien. Il n'a que dix ans lorsqu'éclate la révolution en juillet 1936, mais il se souvient d'avoir vu brûler l'argent de la Banque et comment on a constitué une importante collectivité industrielle. En 1939, après la défaite, alors que sa mère est en fuite et son père en prison, il est contraint de travailler dans une ferme. En 1948, fuyant (avec sa famille) la dictature franquiste, il traverse clandestinement les Pyrénées et se réfugie en France à Avignon. En 1955, il commence à militer au sein du Mouvement Libertaire Espagnol en Exil et en particulier à la "Fédération Ibérique des Jeunesses Libertaires." De 1961 à 1976 il participe activement à l'organisation de campings libertaires internationaux dans le sud de la France. En 1961, il est délégué de la FIJL et de la CNT au congrès du Mouvement libertaire à Limoges où sera créée une organisation de combat "Défense interieure"(DI) chargée de coordonner l'action révolutionnaire clandestine contre le franquisme. Il en fera partie, se chargeant en particulier de l'envoi de véhicules et d'armes en Espagne. Il connaissait notamment Delgado et Granados qui seront exécutés par les franquistes durant l'été 1963. Sur la pression de Franco, les autorités française persécuteront alors les antifascistes de la FIJL qui seront emprisonnés puis libérés après une grève de la faim. Il sera également un militant actif sur son lieu de travail et en particulier en mai 1968. En octobre 1976, fiché comme antifranquiste, il est assigné à résidence à Belle-Ile-en-Mer avec d'autres activistes, durant la visite officielle du roi d'Espagne en France. Un film de Gabriel Auer retrace cet événement "Vacances royales"(1980). Lassé des polémiques, il cesse ensuite de militer à la CNT, mais ne reste pas inactif durant sa retraite. Il navigue sur un bateau en Méditerranée avec des jeunes en difficulté et travaille durant une dizaine d'années, aux côtés de Marianne Enckell, au CIRA de Lausanne, où il contribue à exhumer l'histoire d'une Ecole Libertaire en Pays Valencien, au début des années 20. Il a également travaillé avec la "Comunidad del Sur" de Montevideo, avec la compagnie de théâtre de rue "Ilotopie" et a même construit un bateau dans son jardin. Il retrace ses souvenirs dans le livre "La Saveur des patates douces" (ACL 1998). "Je me rappelle bien quand ils ont brûlé l'argent, à Alcira. C'était tout au début de la révolution: les anarchistes, et peut-être bien les socialistes de l'UGT aussi, ont éventré la banque, pris tous les registres, tous les documents. Ils les jetaient par les fenêtres et en faisaient un feu sur la place, en dessous. Et voilà que l'argent aussi, les billets de banque ont volé par les fenêtres, se sont enflammés!" 2009 -- US: A New Theme? Newspapers report yesterday's bankruptcy filing by theme-park operator Six Flags. $1.8 billion in debt leaves the tattered flags drooping a bit. 2011 -- A new diary by Che Guevara of his time fighting in the Cuban Revolution between 1956 & 1958 is published. 2012 -- England: Mental health problems are no longer to be a bar to becoming an MP in the United Kingdom. Confirms what the citizenry has known for centuries.